C. Alexandria is an artisan jewelry line created entirely by hand, uncomplicated yet distinct. Influenced by nature, simple geometric forms and our ancient past. We strive to create quality pieces that are approachable but make a statement. Each piece begins as a concept or sketch, then is brought to life with a variety of method and materials. Founded in 2011 C. Alexandria is designed and created locally in Madison Wisconsin. + A Special Thank You to H. Claire Photography for all model photography! Beauties! They are going to be great to wear out at holiday parties! Ribbon and Ring Posts. 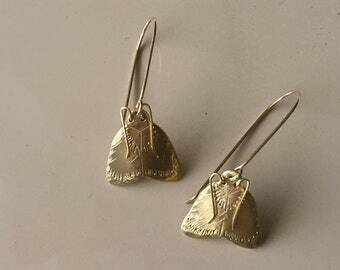 Brass earrings. Statement earrings. Bold earrings. Ring snd hoop dangles. Modern. Sculpture earrings. Hair Stick. Hair Pin. Round hair Pin. Hair Accessory. Hammered Brass Hair Stick. Hair Pin. Round pin. Golden Brass Hair Stick. Brial Hair. Fall collection & lookbook coming soon! 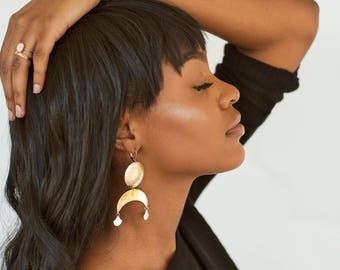 Moon and Sun Statement Earrings. Gold Statement Earrings. Big Brass Earrings. Crescent Moon Earrings. Gold Chandelier Earrings. Dramatic. New things to come! Playing with stones. Moth Earrings. Insect Earrings. Flying Insect Dangles. Gold Moth. Brass and Gold Fill. Curiosity Earrings. Unique Earrings. Gift for Her. Owner and designer Cire' Cross lives in a small suburb of Madison with her husband Mike & white German Shepard Blitz. All packages are shipped via USPS first class mail or International First Class Mail. We are not responsible for items not received due to an incorrect address, and do not refund lost or stolen packages. If you would like Priority shipping over seas please convo me for an estimate prior to purchasing.